Whatever your level, you won’t get left behind – your Jog Leader will make sure the session is right for you. 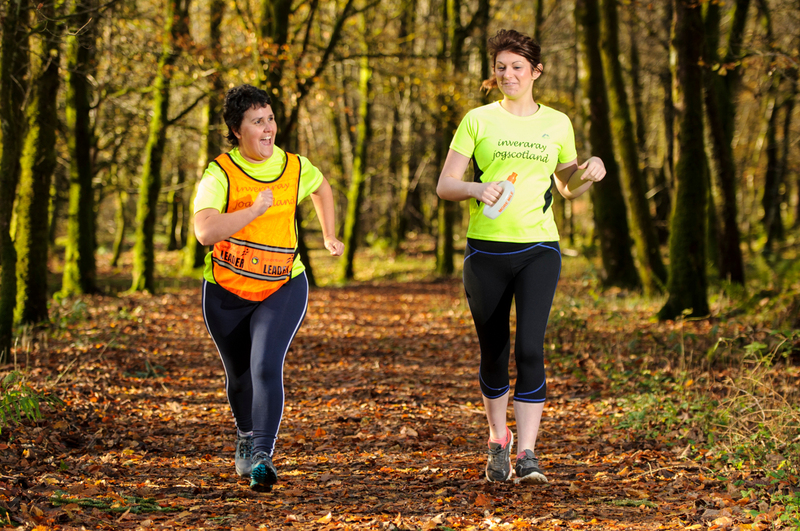 jogscotland is for everyone, including complete beginners. If you are thinking about getting active for the first time, or if you are overweight, or lacking in confidence, we will make you feel welcome and support you as you get started and progress. The bands below are a general guide, but jog leaders are trained to plan flexible sessions, and will help you to get active at a pace that suits you. Not all groups run according to these strict levels, but they are a useful guide. When you first move up to intermediate and advanced classes, you might find that you are running for a shorter period of time than you are able, but your Jog Leader will encourage you to run faster during that time. To start our beginners’ classes comfortably, we recommend that you should be able to walk for 30 minutes at a brisk pace (one that leaves you slightly short of breath). If you have any health issues that you think might affect your ability to exercise, we recommend that you talk to your doctor before starting. If you tell them you are planning to start a gradual, progressive exercise plan, they are likely to encourage you on your way. At your first session, you will aim to alternate 30 seconds of walking and 30 seconds of jogging for 10 minutes, with a warm-up at the beginning and a cool-down at the end. By the end of a 10 week beginners’ block, you should be able to jog continuously for 15 minutes. These classes follow on from the beginners’ sessions, so we recommend that you should be able to jog continuously for 15 minutes before starting. At your first session you will aim to alternate three minutes of jogging with two minutes of walking, repeated five times. There will be a warm-up at the beginning and a cool down at the end. By the end of the 10 week block, you should be able to jog continuously for 30 minutes. You can then progress either to intermediate, or intermediate two, depending how quickly you are comfortable progressing, and how many times per week you are able to jog. We recommend that you should be able to jog continuously for 30 minutes before starting an intermediate session. At your first session you will aim to alternate 10 minutes of jogging with 5 minutes of walking, repeated three times. There will be a warm-up at the beginning and a cool down at the end. By the end of the 10 week block, you should be able to jog continuously for 40 minutes. These classes offer a faster progression for people who can already jog continuously for 30 minutes. At your first session you will jog continuously for 30 minutes, with a warm-up and a cool-down. By the end of the 10 week block, you should be able to jog continuously for one hour. We recommend that you should be able to jog for one hour or 10k before starting an advanced group. At your first session you will aim to jog for 45 minutes, with a warm-up and cool-down. By the end of the 10 week block, you should be able to jog continuously for 1.5 hours or 10 miles/15k. We recommend that you should be able to jog for 1.5 hours or 10 miles/15k. At your first session you will aim to jog for two 30 minute sessions with a 5 minute walk in-between, with a warm-up and cool-down. By the end of the 10 week block, you should be able to jog continuously for 2 hours.